Bollywood CineTalk: Super Stardom of "The Salman Khan"
Super Stardom of "The Salman Khan"
Nowadays, if you witness festive atmosphere for a Hindi movie outside theatres in India, specially single screen theatres and fans are seen garlanding huge posters of the hero in the film, breaking coconuts, playing music from some of his older hits, dancing on the streets, you should understand you are witnessing super stardom of Salman Khan. From Maine Pyar Kiya to Dabangg 2, one thing has remained constant and that is the Salman Khan mania. His fans call it "Salmania". 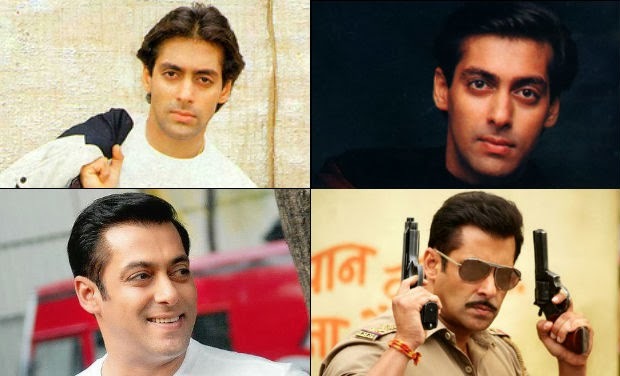 What makes Salman a mega star of Bollywood, The type of stardom only a few in the history has experienced? 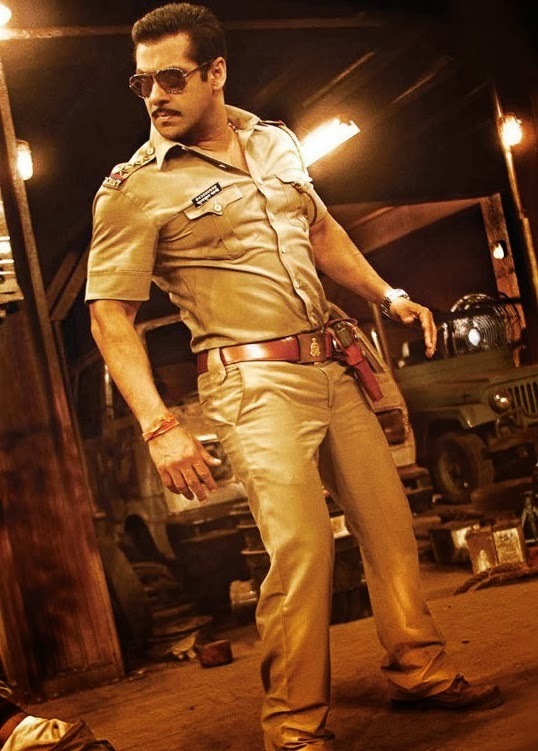 Did Salman become superstar after Dabangg? Let's see what Joginder Tuteja had to say after the success of Wanted. "So is Salman Khan back after a rather poor run with Yuvvraaj and God Tussi Great Ho? Industry doesn't quite believe so. Don't be shocked because as per practically each and every film personality that this writer reached out to, the verdict is common - 'Salman Khan was never gone in the first place. He was, is and always would be a superstar.'" In Maine Pyar Kiya, he began as the cute yet stylish loverboy who would do anything for his love. Women of all ages swooned over this new lad. 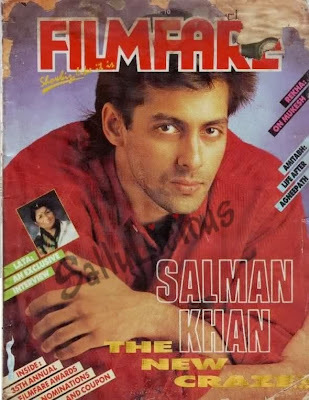 You might remember the magazine cover saying ‘A million dollar star is born’, with a smashing image of Salman. One of our good friends, A moderator of IBODB Forums, Suhas, who is a very knowledgeable person when it comes to cinema and films, has wrote some interesting things about Salman's stardom. We are just going to share his experinece and knowledge with all of you. When it comes to action Salman is way ahead of any other superstar in Bollywood & EID would always belong to Salman. 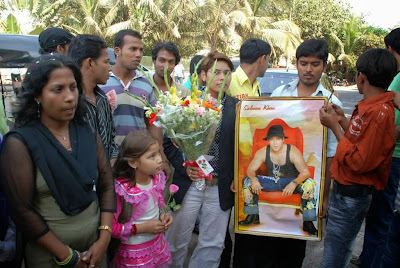 If Salman's absence in EID could be cashed in this big by Shahrukh Khan this year then imagine Salman grabbing the EID spot with this fan following that takes everything so personal. 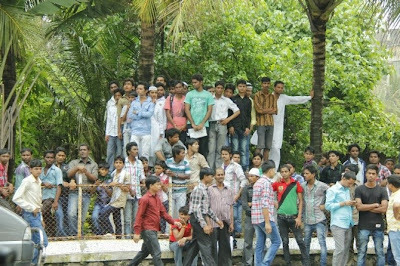 People go to a film to get entertained, but majority of the people (current times) go to a Salman movie to celebrate Salman's presence on screen. The roof-cracking cheers in my multiplex last night during the Salman's cameo in Phata Poster Nikhla Hero has given me the assurance regarding the craze that's there for Salman & how much people are waiting for his movie to release. In short, with Salman Khan it's all about Hero worship. I witnessed this craze during Wanted. I watched it first day first show along with a sellout crowd who broke the theater glasses to get tickets for first day while the fans were burning crackers & doing pooja to the banners outside. 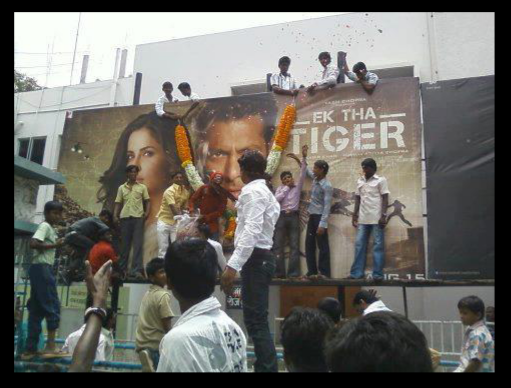 That theater always releases every Salman movie & in 2009 the whole entrance was broken/bashed by the crowd who just couldn't wait to get inside & within few months they did the damage again. Also it was repeated with Ready & Bodyguard too. This happened in Mysore, a city in Karnataka state where South Indian languages dominate & it's the place where people get so personal when it comes to their favorites that nobody even considers Bollywood stars to be any bigger than the regional stars. Since I started understanding the fangiri concept (I've no idea about craze for Big B in Mysore during his prime) it's Rajkumar family that used to get the biggest response with every single one of them being celebrated while Dr.Rajkumar is still & will always be a god to the fans. Vishnuvardhan, Ambarish, Sudeep & Darshan are the Kannada superstars who enjoy that fan following who worships them. Along with them comes Chiranjeevi, Nagarjuna, NTR family, Pawan Kalyan & Mahesh Babu who enjoys fans who worship them literally. No need to talk about Rajini & Kamal. So leaving all these superstars the only actor from Bollywood who gets literally worshipped, that people (read fans) decaorate the theaters, attack the distributors/exhibitors for the first day's tickets, build a huge cut out & worship it is SALMAN KHAN. I'm not exaggerating or anything. It's the hard truth that Hindi movies don't run for long. 100 days to bhool hi jao. The last 100-days film was Kaho Na Pyaar Hai in Mysore. Even 3 Idiots didn't run that long but anyways nowadays no movie runs for that long. But for Salman even if it was a movie which would be so bad that it runs only for 2 weeks, then also the above mentioned response is a must. People will be crazy enough to celebrate it. They did it for Yuvvraaj & Main Aur Mrs Khanna too. It's all the result of his rigorous image makeover among the public. 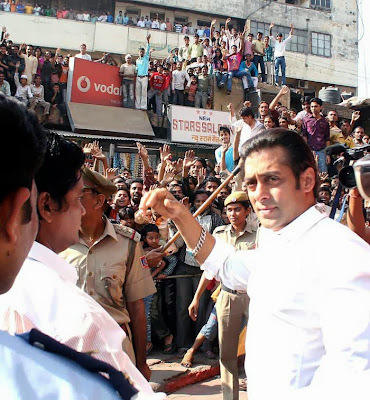 When Salman went to jail in 2005, there were people outside that jail waiting for his release everyday till he was released. That's exactly what changed the scenario & it is that kinda fans whom Salman concentrated thereafter to increase in huge numbers. 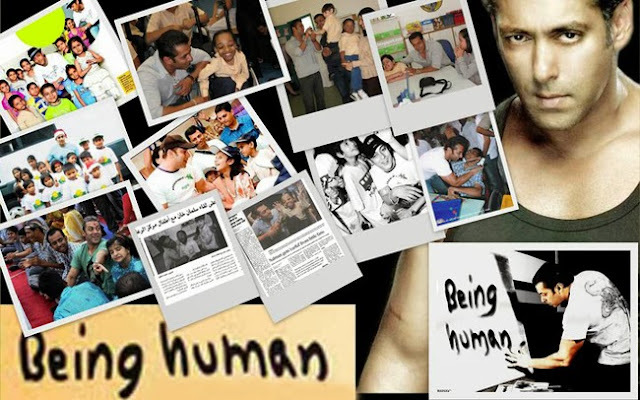 Salman has stayed away from the controversies & post 2008 all you hear about Salman is either his films or his Being Human. That helped him in a huge way. Look at how Ek Tha Tiger was recieved, don't just believe on critic reviews, just look at how masses recieved it & how classes recieved it. Classes appreciated it while Masses missed the Dabangg factor in it, that's why Dabangg 2 turned out to be huge earner in it's second week. EID more than superstars, it belongs to the masses. They want mindless, entertaining dhamakedaar action film. Salman provided them for the masses while this time Shahrukh took his place. If Salman had come in this EID then also the opening would've been same or more in India while overseas would've been lesser compared to what Srk can achieve. Current scenerio in India is like that, Any other superstar needs a very good film to win over Salman while Salman's mediocre film will make it through without much hurdle. Salman vs Shahrukh/Aamir, it'll be battle out in the multiplexes but when it comes to B & C centers it's always going to be Salman Khan since he's the darling among those masses who've supported him since 1989 even with his worst films. Even most of his flop films have done most of their business in B & C centers vowing to the popularity of Salman in those centers. Veer could get "Below average" that's exactly because of B & C centers audience. When it comes to India, from past 3 years Salman has outgrown everyone in Bollywood in terms of the reception he get among the audience. What the future holds for him, we don’t know. But all we can say is – we are waiting to see more from you and of you, Salman!